Fully backwards-compatible with current ROS navigation. Actions for the submodules planning, controlling and recovering, and services to query the costmaps are provided. This interface allows external executives, e.g. SMACH, or Behavior Trees, to run highly flexible and complex navigation strategies. Comprehensive result and feedback information on all actions, including error codes and messages from the loaded plugins. For users still relying on a unique navigation interface, we have extended move_base action with detailed result and feedback information (though we still provide the current one). Separation between an abstract navigation framework and concrete implementations, allowing faster development of new applications, e.g. 3D navigation. Load multiple planners and controllers, selectable at runtime by setting one of the loaded plugin names in the action goal. Concurrency: Parallel planning, recovering, controlling by selecting different concurrency slots when defining the action goal. Only different plugins instances can run in parallel. Please see also the Move Base Flex Documentation and Tutorials in the ROS wiki. We have created Move Base Flex for a larger target group besides the standard developers and users of move_base and 2D navigation based on costmaps, as well as addressed move_base's limitations. Since robot navigation can be separated into planning and controlling in many cases, even for outdoor scenarios without the benefits of flat terrain, we designed MBF based on abstract planner-, controller- and recovery behavior-execution classes. To accomplish this goal, we created abstract base classes for the nav core BaseLocalPlanner, BaseGlobalPlanner and RecoveryBehavior plugin interfaces, extending the API to provide a richer and more expressive interface without breaking the current move_base plugin API. The new abstract interfaces allow plugins to return valuable information in each execution cycle, e.g. why a valid plan or a velocity command could not be computed. This information is then passed to the external executive logic through MBF planning, navigation or recovering actions’ feedback and result. The planner, controller and recovery behavior execution is implemented in the abstract execution classes without binding the software implementation to 2D costmaps. 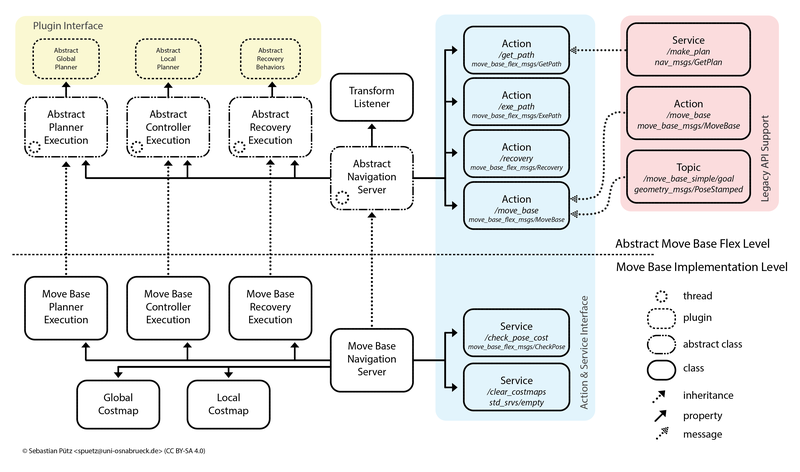 In our framework, MoveBase is just a particular implementation of a navigation system: its execution classes implement the abstract ones, bind the system to the costmaps. Thereby, the system can easily be used for other approaches, e.g. navigation on meshes or 3D occupancy grid maps. However, we provide a SimpleNavigationServer class without a binding to costmaps. Add new navigation server and core packages using grid_map. But of course your are welcome to propose new fancy features and help make them a reality! Pull Requests are always welcome!